Hello everybody and welcome to drawing tutorial on how to draw a Porsche 911. Porsche 911 is sports car produced by the German company Porsche AG in the body of a two-door coupe or cabriolet based on it in different generations produced from 1964 to today. 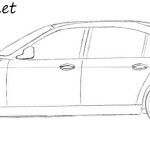 In order to draw any car we need to draw its general outlines. 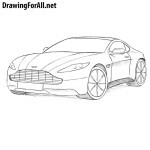 We did it in other drawing lessons about cars and we will do it now. Use only light lines, as in the future we will have to erase everything that we drew in this step. 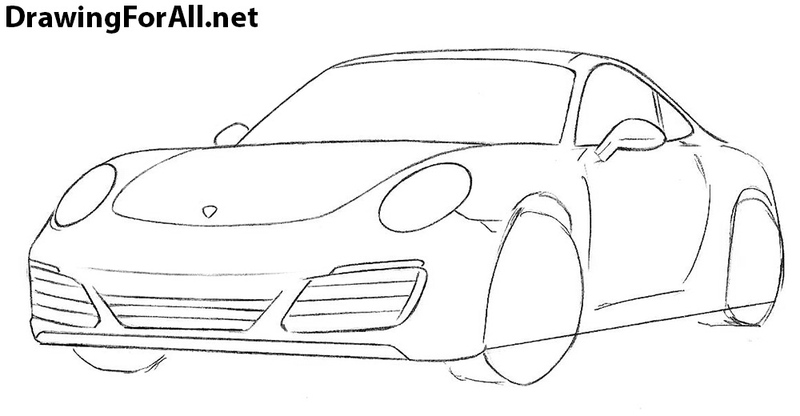 In front of our Porsche 911 we sketch out its famous headlights with the help of ovals. Between the headlights mark up the car logo and at the very bottom of the front section draw the radiator grilles divided into three parts. Continue to add general details to our Porsche. In the upper part we sketch out the front and side windows. A little lower sketch out the mirrors and lines of doors. At the end of the step draw the wheels and drive to the next step. So, let’s give our Porsche a beautiful and finished look. 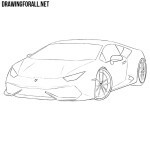 Carefully draw out the headlights that should be perfectly even. 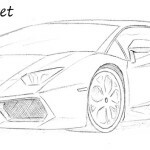 In the same step carefully draw out the hood. 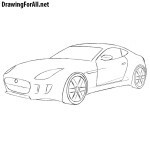 Get down a little lower and draw the radiator grille divided into three parts. By the way, along with the famous oval headlights this kind of grille is also a distinctive sign of this car. 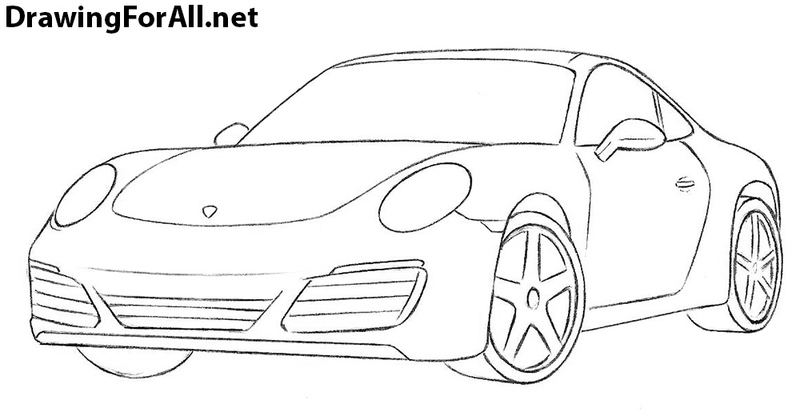 Pass to the top of our Porsche 911 and draw the roof. 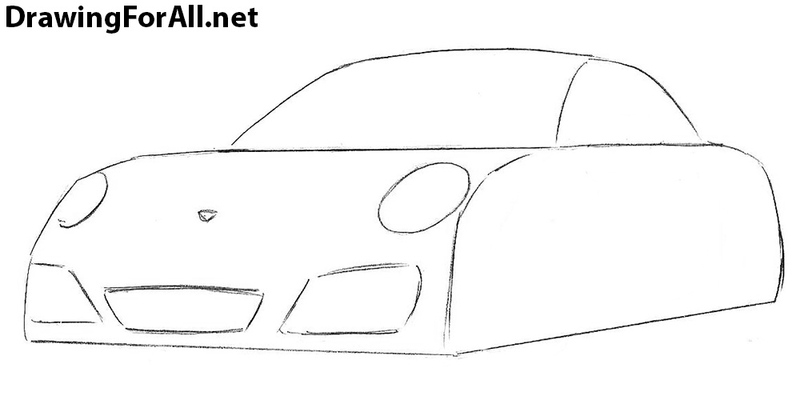 Next draw out the lines of the front and side windows as well as the rear view mirrors. 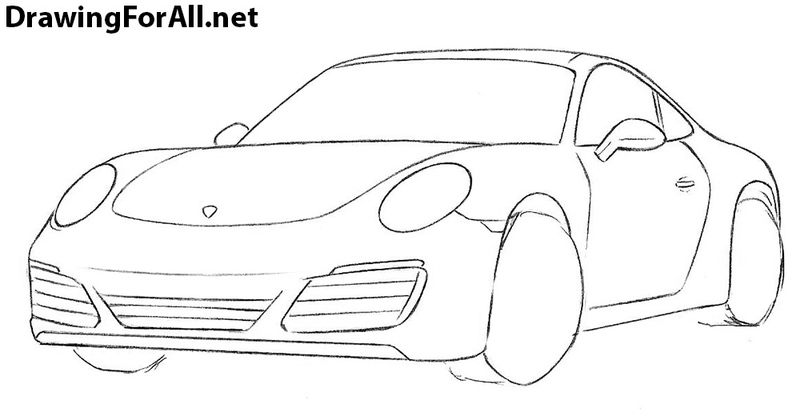 Continue the roof line and draw our the back part of Porsche 911. Next, draw a door and a handle. In the same step we will draw wheel arches and a sill. This is both a difficult and easy step at the same time. 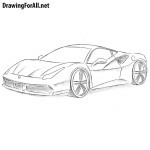 We need to draw out the wheels, which should look like perfectly smooth ovals. 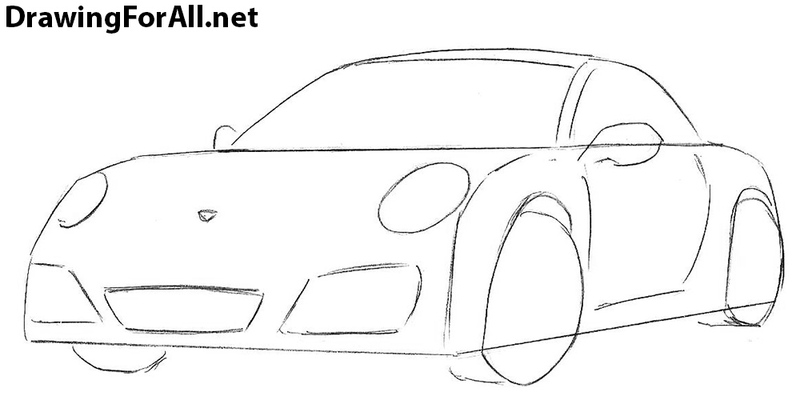 So we got to the last step in the lesson about how to draw a Porsche 911. Here we need to draw rims. You can copy from our example or choose any other form for them. Drawing lesson is over, and now you have a brand new Porsche 911 on your sheet, dear car enthusiast. And i think it was much easier than buy a Porsche and think about Porsche car insurance. By the way, you can leave the Porsche 911 as it is in our example or add shadows. This you can learn in our lessons about Lamborghini and Ferrari. Also do not forget to share this and our other drawing lessons and subscribe to us in social networks..